Editor’s note: This guest post was written by Salih Seçkin Sevinç, creator of the fantastic Turkish-language food blog Harbi Yiyorum (loosely translated as “Eating, For Real”) and the man behind our recent mouthwatering series of reports from Gaziantep. Kanatçı Haydar started providing services in the chicken wings sector beginning in 1996, a year after the wings craze first appeared in Turkey. What Colonel Sanders means to Americans, Kanatçı Haydar is for Turks. Just like the Colonel, Kanatçı Haydar Abi started his business from scratch, complete with his own special chicken recipe. A conflict with his partners led him to leave his original restaurant – in the Yenibosna area, not far from Atatürk Airport – and never return. 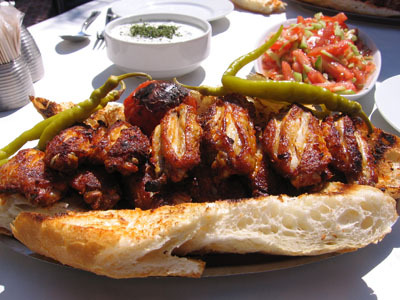 Instead, he opened a new chicken wings restaurant (called, of course, Kanatçı Haydar) not so far from his first place. Anyway, to find out more about the real Kanatçı Haydar (his life, story and his fight) you can always check www.kanatcihaydar.com. But part of his legacy remains the original “Meşhur Kanatçı Haydar’ın Yeri,” which is the subject of today’s review. Don’t get angry, Haydar Usta! And the other thing that you can’t forget is the endless stream of small moist cloths you are given to clean your hands. The chicken wings are always served on toasted slices of bread that have soaked up the wings’ hot sauce. This is the tradition. In addition, your wing will be served with cacık (diced cucumber, garlic and mint in yogurt), salad and, if available, brined or grilled hot peppers. And it’s worth noting that unless you specify otherwise, your wings will be served spicy. Fake, real, whatever. After a recent visit to the original spot, we feel compelled to send out our greetings of selaam to the holy Kanatçı Haydar Usta who founded these juicy and delicious wings!